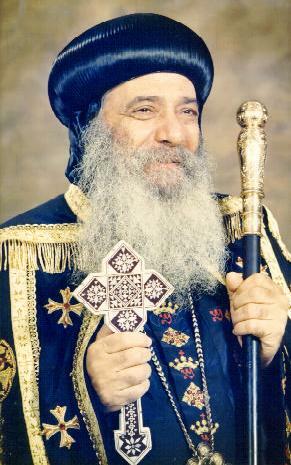 :H. H. Pope Shenouda III. :Dar El Tebaa El Kawmia. :August 1989 - Ist edition. the possibility of returning to Him. The story of man's separation from God. What does it mean to return to God? repentance will be the means of returning to God. This book deals with these two subjects. October 1976 and July 1979. This book is the fruit of these ten lectures. Psalm says "But it is good for me to draw near to God." (Ps. It is indeed! it is however, something more than this closeness. "Abide in Me, and I in you." (John 15:4). he himself dwells in God's heart. than God's will. He begins to want what God does not want. without putting God before him. over them." (1 Sam. 8:7). without asking what God's will would be! cisterns; broken cisterns that can hold no water." (Jer. 2:13). manner, but in his heart, in his love and in his feelings too. started to be concerned about other things apart from God. not in him." (1 John 2:15). and do not practice the truth." (1 John 1:5-6). darkness is obviously cut off from the light, meaning, from God. than light, because their deeds were evil." (John 3:19). with God. What is this fellowship? how can the Spirit of God have fellowship with you? your way and I have mine?" Son too, for the Son is "the wisdom of God." (1 Cor. 1:21). said in the book of Ecclesiastes, "the fool walks in darkness." Christ said to us, "you in Me, and I in you " (John 14:20). being cut off from Christ. from God and from His fellowship. will not set eyes on God. In fact he will be isolated from Him. Testament in the Tent of Meeting. them. In fact he said to them "I do not know you". (Matt. kingdom and His throne and also from the other wiser virgins. those whose names are written in the Book of Life (Rev. will be thrown into the outer darkness. remote from sin and were separated while on earth. whom he had loved in this world. in heaven alongside the righteous man. friend, in order to enjoy his companionship in the eternal life. would derive no comfort from their companionship. them to be joined together in heaven. Saints, from his loved ones and from the angels too. around those who fear Him, and he delivers them." (Ps. 34:7). earth and in the life to come. family who symbolise the community of believers. false; for the Truth is God. (John 14:6). not take your Holy Spirit from me." (Ps. 51:11). The phrase "How long will you hide Your face from me?" (Ps. bear than to be banished from God's sight, as happened to Cain. upon him to torment him. cut off from it and from the other branches. people, "your camp shall be holy" (Dent. 23:14). it says in the Bible: " your speech betrays you ". (Matt. 26:73). between the qualities of the sheep and those of the goats. from yourselves the evil person." (1 Cor. 5:13). receive him into your house nor greet him." (2 John 1-10). leprosy as a punishment, because she spread lies against Moses. sin, are burned outside the camp " (Heb. 13:11). was an example of this division. enter, with Noah, into life, since their acts were unlike his. themselves off from us and no longer belonged to us. Lord, "I never knew you". (Matt. 7:23). isolated himself from the disciples forever. Paul's disciple, Demas, went the same way as Judas. having loved this present world " (2 Tim. 4:10). Sin is often a separation from the Cross of Christ. Sin is love of the world and the wide gate and the broad road. longer I who live, but Christ lives in me ". (Gal. 2:20). from God and the community of believers. behaviour and not reprimand him for his sins. to carry out the spiritual practices which they instruct. connected you to the Lord's love. the whole world, and loses his own soul?" (Matt. 16:26). position, nor is it the divine purpose of your creation. I feel sure that you are bound to return. again to the Ark. (Gen. 8:9). Christ Jesus my Lord" (Phil. 3:8). and something which I do not want. and have my being. (Acts 17:28). rather become like the chaff which is scattered by the wind. (Ps. Glory be to you, now and forevermore. Amen. authority over all the creatures. gave rise to all other problems and all other sins. develop and what were its consequences? enemy of God, with the Devil, that ancient serpent! found it, "good for food, that it was pleasant to the eyes... "
become like God, as the serpent had tempted him. (Gen. 3:5). automatically cut off from the Truth and follows what is false. changeable creature, unstable in his outlook. Life: for God is Truth and Life. (John 14:6). begin to apply to such a person. from God, he became cut off from power and became weak. stand upright or fend for himself. same authority over the beasts of the earth. how his title became "the ruler of this world". (John 14:30). enjoying an intimate relationship with Him. was afraid and said, "anyone finds me will kill me". (Gen.
confusion and worry came over him. from the life of the Spirit. arts and until his sins outnumbered the hairs on his head. efforts until it is brought to completion. with God in your heart. readings, meetings and mataniyas (prostrations). love for God or not? fast, read and perform mataniyas. Prophet Joel, "Turn to Me with all your heart". (Joel 2:12). garments. Return to the LORD your God". (Joel 2:12-13). and by a confusion and wandering of your thoughts. heart giving this practice any weight or value. this idea has probably never occurred to him! God into his fast, like the Pharisee. God to be with the heart. day they are caught up with the desires and lusts of the world. fro" (Gen. 8:7), could well be applied to these people. previous sinful ways and once again be separated from God! To return to God means to return with a new heart. thinking about spiritual matters, sin lost any influence over him. just as the people of Nineveh returned to Him. humility. So what did they do? out vehemently to God and returned from their wicked ways. Thus God returned to them. minister to the LORD, Weep between the porch and the altar." difficult to escape from it. He therefore examins every thought and feeling carefully. returned to God, his strength came back to him. does shall prospers." (Ps. 1:3). the Lord with absolute sincerity: "Why do I feel so weak? us to return to Him? God calls us in love, "Return to Me and I will return to you." established in me is something natural. situation. It is not right for you to remain in this state. you began and in which you will live with me in eternity." God himself will be with them and be their God. (Rev. 21:3). out, by rejecting me in your sinfulness'. us, 'Come back to me'. but rather that the earth has turned its back on the sun". the revolving of the earth around the sun. turned our backs and are no longer facing Him. variation or shadow of turning". (James 1:17). Look, for what has taken you away from God. for sure that this separation has come from you. "Remember therefore from where you have fallen ! Repent... "
has taken you away from Him. would I put pressure on you to form a relationship with me. free to follow your own path." However, a person might say: "I want to but I am weak...,"
appointed you... " (John 15:16). to that purity and innocence which Adam once had. deeds, all his wickedness and stratagems. when you were born again of God and clothed in Christ. (Gal. yourself from God and now you want to return to Him. your spirit, which are God's." (1 Cor. 6:19-20). and He is saying. "Return to Me". you will have none without me." confidence shall be your strength." (Isa. 30:15). In this way your youth will be renewed like the eagle's. meaning of the phrase, "it is good for me to draw near to God". "Do I have any pleasure at all that the wicked should die?" God wants us to return, then, for our own good. something which saddens God's heart, without any doubt. who need no repentance." (Luke 15:7). of the Gentiles, to their disciples. (Acts 19:3). this was considered return to God. (Acts 15:19). deprive him of all his pleasures. sinner to Him, by every means. story of the lost sheep and the lost coin are mentioned. St.
How do I return to God? The most effective means to help you return to God is prayer. my state and draw me back to you once again. Without you I am nothing. When I lost you, I lost my life. "those who trouble me rejoice when I am moved " (Ps. 13:5). " help me to return to you. return to You? Yet it is only by You that I can be saved from it! who can take it from me. that you can lead me in the procession of your victory. than snow" . (Ps. 51:7). give me the strength to carry it out. successful is the person whose repentance is sincere. the strength to return to Him. wait until they have received..! without waiting to receive even a promise or some comfort. accepted me and taken me back into your love." which you must prove that you are serious in what you ask. use it well and not waste it. heart of stone out of your flesh and give you a heart of flesh. statutes, and you will keep My judgments and do them". Dear Lord, in my case, where are these promises? and then leave. I take my stand and wait here for You, O Lord. until you have taken me back to you. you can, until you receive. Hannah, the mother of Samuel. a promise that the Lord would give her the desire of her heart. would abandon your praying and go off and sin against God! told God, that you would never leave Him. back to God and to His love. perfection only comes from you. just learning to walk, that it can happen." This is how I want you to pray and to receive from the Lord. people and to His saints; But let them not turn back to folly"
supplication; The LORD will receive my prayer "
you have requested. (Ge. 28:12). throne of God. (Rev. 5:8). you: "Your iniquity is taken away, And your sin purged ". we are glad '" (Ps. 126:2-4). crown, as happened to the Apostles and men of faith. + "Return to Me and I will return to you." (Mal. 3:7). causing it will have disappeared. Lord was no longer with them. Amorites (Josh. 13:21) and all the nations on the earth. hands of their enemies and had been unable to withstand them. heard their weeping and saved them. who oppressed and afflicted them. (Judg. 2:18). named Othniel and he rescued them. Cushan into his hands, "So the land had rest for forty years". He came back to them and rescued them. and hung their harps on the poplar trees. (Ps. 137). How did the Lord return to them? He returned because of the tears of Nehemiah and Ezra. let Your ear be attentive to the prayer of Your servant......"
was able to rebuild the walls of Jerusalem. we are left as a remnant." (Ezra 9:3-15). The Lord heard and returned to His people. bring all his people back to God and God returned to them. bring God back to His people. you and them, consider how you can return to God. when innocent hands are stretched out to Him. he just said, "The LORD gave and the LORD has taken away"
prevailed against me." (Ps. 129:2). able to overcome you and will weaken your resistance. return to Him, that your strength might come back. What does the phrase, "I will return to you" mean? forgive their iniquity, and their sin I will remember no more." It is wrong to put yourself on the opposite side to God. The sinner flees from God. He does not like to talk with Him. honour Me with their lips, but their heart is far from Me,"
said for the sake of performing a duty, or to satisfy himself. God, because sin has created a barrier separating him from God. the level of actually fighting against Him. St.
Father is not in him." (1 John 2: 15). us. You reconciled those living on earth with those in heaven." You only, have I sinned, And done this evil in Your sight ". that, it was against others too. for the result of the first, burnt sacrifices were offered (Lev. 1). mankind, who was doomed, by being an offering for his sin. is no longer pleased with him. door of the tabernacle of meeting before the LORD" (Lev. Lord." (Lev. 1:9, 13 & 17). not my salvation, but that you should be pleased." forgive, without my need to ask." to be saved from punishment. from God and created a breach between you? 13:1) and showered us with His good gifts. until death, and I will give you the crown of life." (Rev. 2:10). desire. They do not possess that steadfast, faithful love. considered to be the utmost disloyalty? Perhaps those who did not know God before have an excuse. not be seen as traitors to His intimacy and love?! Have dealt very treacherously with Me". (Jer. 5:11). medium for guidance " (1 Chr. 10:13). burned incense or offered burnt offerings ... " (2 Chr. 29:6-7). you on Christ's behalf. Be reconciled to God." (2 Cor. 5:20). Here I will dwell, for I have desired it." (Ps. 132:14). It is He who says to your soul, which is so precious to Him, "
desire your beauty " (Ps. 45:10-11). the reason for the divine incarnation. The blood of our Lord Jesus was the price of this reconciliation. heaven, having made peace through the blood of His cross." trespasses to them." (2 Cor. 5:19). the cross, thereby putting to death the enmity.." (Eph. 2:14-16). hostility and removing the barrier which divided us from Him. day. This is why there is the "ministry of reconciliation"
word of reconciliation". "We implore you on Christ's behalf..
Be reconciled to God" (2 Cor. 5:18, 19-20). God wants to be reconciled to you by every possible means. What else will God do? loved ones, if need be, for the sake of our reconciliation. were led to reconciliation through adversity. (Gen. 44). with Him as you remember His love. Every adversity whispers in your ear: Be reconciled with God. astray, or the enemy of Goodness, the Devil, preys upon you. you were to lose this opportunity to be reconciled with God. whom you can have an eternal relationship that will never end! and how important it is for you to be reconciled to Him. chicks under her wings, but you were not willing!." (Matt. The Lord is standing at the door, but we do not open it to Him. hinder some people from responding and what is the solution? to God. God Himself will unite you to Him. crying out, "I want to sin". gate, which is against his wishes. characteristic of his, or an intractable will. longer I who do it, but sin that dwells in me." (Ro. 7:19-20). others... Is it so difficult for You to change my state?" the holy feelings appropriate for this reconciliation. My son, why don't you say to God, "give me your heart". (Prov. 23:26) "take it as it is..."
is no love for you in my heart, then please give me this love. certainly Your grace will be strong enough to save it. man avails much." (James 5:16). with all your heart, and lean not on your own understanding." What God wants from you is your heart and will and faith. you both to will and to do for His good pleasure." (Phil. 2:13). forces anyone to be reconciled with Him. seriousness of your desire to be reconciled to Him. encounter. What else do you need to do? don't then turn back and join forces with His enemies. and fully established in God. benefited from it, because their words were not sincere. which the reconciliation is turned into love. Spend your time with God and occupy your thoughts with Him. week. Let it be a relationship which lasts a whole lifetime. are not the goal but the goal is God Himself. achieve this closeness with God, in continuous love. for the one of virtuousness. your relationship with God always strong. existence in You. (Phil. 3:8). reconciled with God and who loved Him. when he can no longer silence this voice. protests against it, however much he tries to ignore it. sake. For these are wars from Satan. consider us to be among his troops because we were led by him. has nothing in Me.." (John. 14:30). prospect of eternal life and the kingdom of God. be revealed in us".. (Rom. 8:18). the things which are not seen are eternal." (2 Cor. 4:18). angry with him for no reason at all! through their words and their lives. 10. Be quick to respond to the voice of God in your heart. as in the rebellion." (Heb. 3: 5). must prefer God to yourself. especially to God is at the beginning. To deny yourself on earth, is to win yourself in heaven. will lose it, and he who loses his life for My sake will find it"
you gone to for His sake? principle and keep it in your heart. God first, others second and yourself last of all. tolerance in its dealing with others.